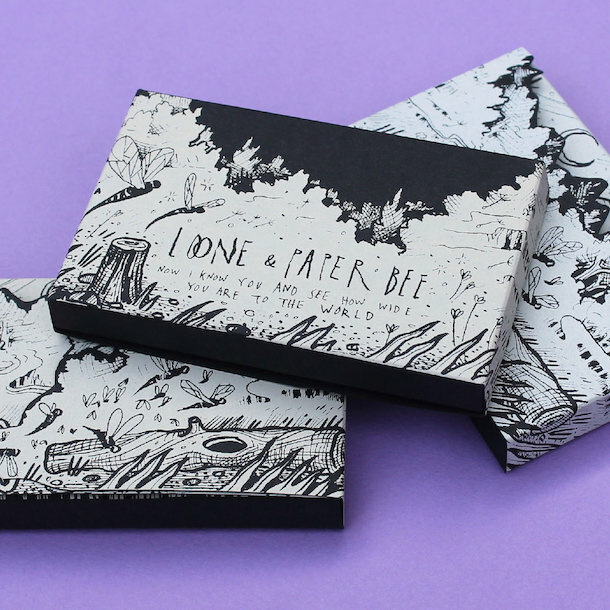 Western Massachusetts’ Loone and Paper Bee have a lot of heart, and a good deal of energy to match. The two projects, which share members, cull their sound from lighter folk and heavier emo influences and don’t hesitate to upset balances in order to achieve a rare dynamic intensity. In December they released a split, Now I Know You and See How Wide You Are to the World, and it’s finally seeing a cassette release this summer. The tape’s first half is the first full-band release from Loone, the project of Noel’le Longhaul, and it’s markedly full-fledged, with Nick Berger’s vocals alongside Longhaul’s and heavy-hitting drums and synths from Alyssa Kai. Rolling toms and churning guitars give cushion to voices that curl together gently and occasionally break into shouts. The lyrics are anthemic, tossing on the instrumentation’s rough waves—an apt fit for this summer’s tourmates Told Slant and The Hotelier. Still, the music has a baseline melancholy that emerges in full with lines like the crushingly put “Everyone I’ve ever loved is full of ghosts / every time they leave they make another one” on “Offering”. The five accompanying tracks from Paper Bee are as crushing, but oriented toward a different experience, one leaning more toward a straightforward rock sound. Paper Bee is somewhat of a permutation of Loone, with Longhaul on drums, Kai on bass, and Berger on guitar and vocals. Circling vocal harmonies from Berger and fiery guitar sections taper off into tangled narratives and soft assurances—”I want to see you laughing and I want to know your needs are being met.” In this side and in the first, there’s a tremendous, aching sincerity. It’s a thing that people are always so into, and obviously there are tons and tons of people making beautiful home-made releases, but without the printmaking skill set and equipment it can be hard to produce something super nice but still hand made en mass (well I try to keep it fairly small).. and it’s impossibly expensive to commission something like that – so naturally the way to make these things with and for my friends without them paying me was to start a label! The [first] release was actually a final project for a book arts class – this tape – that was my band while in school too. That was a pretty small edition – so I made another simpler version in a larger run with Mike and Dave aka Double Double Whammy (which also started possibly at exactly the same time?) – and then there was a Mt. Home! Doing more than just music has always been important to me, and we’ve done books and prints throughout the years as well. The four of us [Matt Van Asselt, Tim Woulfe, Elaiza Santos, and Nora Einbender-Luks] will have autonomy in what we choose to produce/contribute but will also be collaborating with each other and other artists and mutually supporting each other’s projects. I think in essence the project will be same – just with a larger internal support system and a little more specifically community oriented. There is so much great art and music coming out of our community.. and we want to honor that and let people really take the time and be given some resources to make the art that they want to make. He notes that Woulfe and Santos of Apollonian Sound have been working on putting together a newspaper-style periodical as part of the new undertaking. Until the new site goes live in July, the current Mt. Home Arts will have a sale: spend at least $20 to get 15% off automatically, and with the code “WOW” you can spend at least $40 to get 25% off. You can stream Now I Know You and See How Wide You Are to the World in full below and preorder it from Mt. Home here. Scroll down to see Loone’s June and July tour dates with Told Slant and The Hotelier.